The leader of the Nepal rescue team reported that last Thursday, a member of his crew, Phurba Sherpa, died on the tallest mountain in the world. The 25-year-old guide was fixing a route near the summit when he had an accident and fell. Phurba’s death is the first of 3 fatalities that spawned from Thursday to Saturday on Mount Everest. A Dutch man named Eric Arnold also died after reaching the summit. The owner of Seven Summit Treks, Tashi Lakpa Sherpa, told the press that on the way down, after conquering The Everest, Mr. Arnold started feeling sick and died before reaching the nearest camp. According to his Twitter Biography, he was a high performance triathlete, and he was on his fifth attempt. Tashi Lakpa Sherpa suspects a heart attack is what got Eric Arnold. On Saturday, Maria Strydom who was a finance teacher at Monash Business School in Australia, died in camp IV which is the last one before the summit. The woman wanted to conquer the 7 summits, and she had already completed some of the most difficult routes, such as the Denali in Alaska, Aconcagua in Argentina, Mount Ararat in Turkey and Kilimanjaro in Africa. The woman was with his husband which is still fighting altitude sickness in a hospital. Climbing Mount Everest has been described as the “eternal struggle between man and nature”, a lot of people have seen the summit, but also, many of them have died in the attempt. According to reports, more than 200 people have died on the mountain, and most likely, a greater number of corpses remains on it. Rescuing a person that is trapped on the Everest is very difficult and risky, but pulling out a dead body is much more dangerous. Corpses get totally frozen, and takes at least 8 Sherpa guides to retrieve one from the mountain. The tallest mountain in the world is a dangerous climb, but the most dangerous thing is not the cold or having an accident, it is altitude sickness. Also known as acute mountain sickness, it manifests randomly on people. The higher you are from the sea level, the less oxygen there is, and it is this lack of oxygen that affects the human body in such a negative way. So far, no one knows who is more susceptible to it, but specialists have determined the symptoms and at what altitude they start appearing. According to science, altitude sickness starts kicking in when you are at 1,500 meters over the sea level (4,900 feet). Most ski resorts are at this height, and people usually feel better after going back to a lower altitude. The next stage which is labeled as “very high altitude” begins at 3,500 meters (11,500 feet), and this is where things get really dangerous. Acute mountain sickness’ symptoms have been compared to those of hangover or a strong cold, but after reaching 11,500 feet over the sea level, the lack of oxygen makes complications possible. Hypoxemia, a pulmonary edema and severe altitude sickness are common. But there is one more called “extreme altitude”. After the mark of 6,000 meters (20,000 feet), human permanent life is not possible. In this environment, every hour gets you closer to death, literally, and Mount Everest’s highest summit is at 8,848 meters above the sea level (29,029 feet). The latest camp before the summit where climbers can rest is at 26,300 feet which means that even there, they are at risk. That is why 2 thirds of fatal cases on the mountain happen after reaching the summit. After a point, it is basically a race against the clock as much as an adventure. 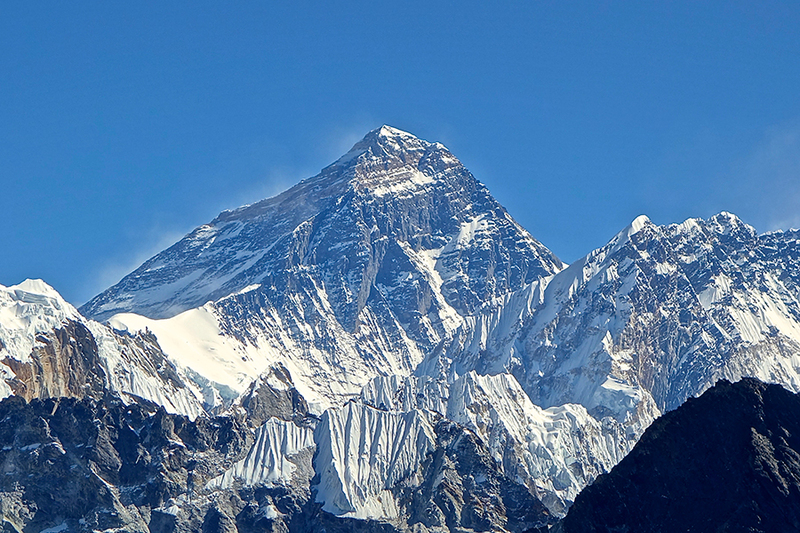 Conquering Mount Everest seems an irrational goal because it’s dangerous and expensive. Paying a lot of money for a guided climb, preparing your body for years, and then battling the mountain for days will give you minutes of the highest view in the world, and the chance of leaving your flag on the top. In spite of all of these, millions of people around the world dream of giving it a try. An interviewer once asked George Mallory, an English mountaineer who was in the first 3 expeditions to the Everest in the 1920’s, “Why climbing Everest?”, and he just said, “because it is there”.